It was to be be a tough course from the start. Philby briefly mentions a year of politically activity in Central Europe - actually in Vienna, which was then in the throes of street battles between communists and fascists. "Then," he writes "something evidently happened. Within a few weeks I had dropped all my political friends and begun to frequent functions at the German Embassy." This is a good example of the allusive, roundabout way Philby refers to his relations with his Soviet controllers. He had been directed to involve himself in Anglo-German relations and made several visits to the Propaganda Ministry in Berlin, before becoming The Times correspondent with Franco's forces in Spain. Philby was, ironically, decorated by Franco himself after surving a shell explosion that killed three of his colleagues. On the outbreak of the Second World War, Philby was instructed to enter British intelligence, which he did with an ease that would later prove highly embarrassing to the British Government. After a period with Colin Gubbins' Special Operations Executive, Philby moved to the Secret Intelligence Service (MI6) as head of its Iberian section. His success in this position would pave the way for the job his controllers most coveted. In 1944, on the eve of the Cold War, Philby, a Soviet agent, was appointed head of Section IX, the newly created anti-Soviet section of MI6. 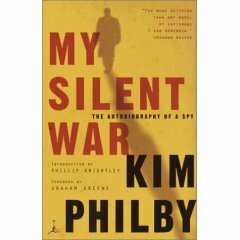 Philby is positively gossipy about the British and American secret services, but the allusive tone returns whenever he discusses his Soviet role. In 1945, a Soviet agent in Istanbul offered to reveal the identity of an NKVD agent at the top of a British counter-espionage organisation. The case found its way to Philby's desk but by the time he made it to Istanbul, the Russian, Konstantin Volkov, had been recalled to Moscow. (He was allegedly flown out of Turkey wrapped in bandages, a detail Philby does not mention.) In his official report, Philby concluded that Volkov's behaviour in the interval may have given the would-be defector away. "Another theory - that the Russians had been tipped off about Volkov's approach to the British - had no solid evidence to support it." Philby writes. "It was not worth including in my report." Philby resorts to similar innuendo concerning the fate of the Anglo-American attempts to infiltrate Ukraine in the early 1950s. "I do not know what happened to the parties concerned, but I can make an informed guess." By the time of the latter episide, the net was beginning to close around him, as his role in the defection of fellow spies Donald Maclean and Anthony Burgess put the authorities on the trail of 'the third man'. He was forced to resign from the Foreign Service, and put under serious investigation. However, the authorities were not yet ready to finger him when he was named in Parliament at the instigation of one of Lord's Beaverbrooke's papers in 1955. Philby's identity as a left-winger is perhaps never clearer than in the relish with which he writes: "I have Beaverbrook's quirk to thank for seven years of decent livelihood, in the nick of time, and of further service to the Soviet cause." As a result, it was not until 1963 that Philby would make his final escape from Beirut to Moscow. Philby was quite prepared to recognise the evils of Stalinism, a concession that was perfectly compatible with the Soviet orthodoxy of the 1960s, but on the evidence of this book, his faith in the communist future was unshaken. His ultimate defence is that without the Soviet Union, "the Old World, if not the whole world, would now be ruled by Hitler and Hirohito." Philby made his choice, whatever one thinks of it, amidst the dark and deadly game of great power politics in the mid-Twentieth Century. This urbane memoir is a unique document of that period, one which is far more intriguing than the most sensational spy novel could ever hope to be.